*Update 25/2/16 One of readers has pointed out to me that cashews aren’t actually Low FODMAP – oops! I posted this recipe back when I was still new to eating low FODMAP and I think I must have mixed up cashews with other low FODMAP nuts. That being said if you still want to try out this dish I’ve made it before with peanuts (I just double checked they are okay) and I promise it’s still just as good! Just keep in mind that with peanuts this is no longer paleo/Whole30. We love Chinese food in our house. We usually maintain a pretty clean diet for the most part, but when it comes to Chinese food all bets are off. One time during one of my visits to Sheffield before I moved here I went out to dinner with Mike and his family at their favorite Chinese restaurant. Mike stuffed himself with so much food and made himself so uncomfortably full that he wouldn’t shut up about it all night. Self control becomes nonexistent in the presence of delicious food. Naturally, I wanted to be able to replicate some of our favorite dishes at home and save us the time and money spent on going out. It really wasn’t surprising to see just how much sugar goes into most dishes. Obviously you can’t have sweet and sour without using something to make it sweet, but I guess things are a lot easier to ignore when you don’t have an actual recipe in front of you with 1 cup sugar listed front and center. Sugar aside, soy’s another problem for me – having just a little bit is enough to make me crash. And what is Chinese food without soy sauce? At least, what is American Chinese food without soy sauce? Thank goodness I found out about coconut aminos. If you’ve never heard of it before, it tastes almost identical to soy sauce but it is made from the sap of coconut trees. It’s low on the glycemic index, it has low sodium, is naturally gluten free, and it has an impressive variety of amino acids, minerals and vitamins. It’s not exactly cheap so I only use it sparingly, however if you’re intolerant to soy it can be a lifesaver. Soy is after all one of the top food allergens. Whether or not you care about eating Paleo, grain free, or whatever you will definitely love this Whole 30 and Low FODMAP Paleo cashew chicken. Like most stir fry’s, this recipe is straight forward and easy enough to make for a quick weeknight dinner. No grain, no sugar, no soy, no worries. Like I said earlier, when it comes to delicious food all forms of self restrain disappear. So if you’re anything like Mike and you end up eating almost the whole lot, it won’t be the end of the world. Like most things in life though, this is best shared! 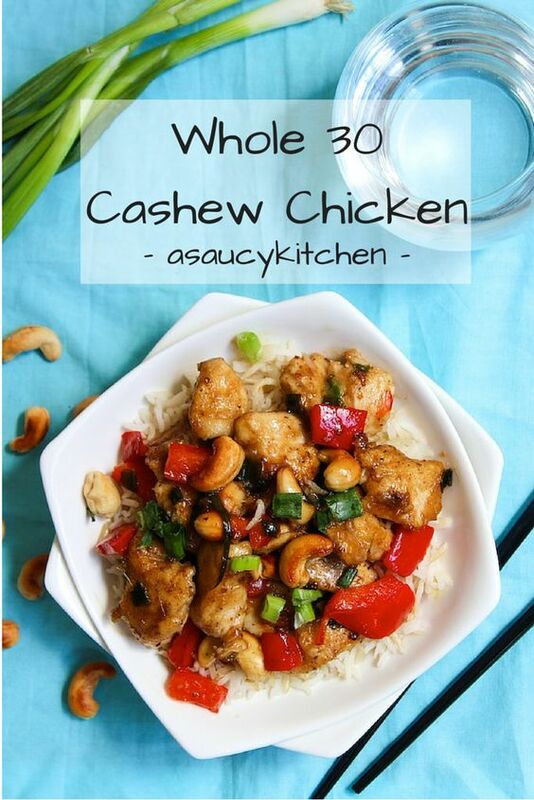 Don’t forget to #asaucykitchen on instagram if you try this Paleo Cashew Chicken! I’d love to see what you make with it! You can also post your pictures to my facebook page! Easy, Whole 30 approved cashew chicken perfect to spice up any weeknight. Toast your cashew on the stove top by spreading them out on a skillet on medium heat. Stir constantly to prevent from burning. Continue for about 5 minutes until the cashews brown and emit a nutty aroma. Remove from heat and set aside until later. Place tapioca flour, salt, and pepper in a small bowl and toss the cut up pieces of chicken to coat lightly. On a medium heat in a large cast iron/skillet heat your oil for frying and add the chicken and brown each side. Lower heat and add the diced red pepper and the spring onions, stirring occasionally. While the chicken cooks, add the chicken broth, coconut aminos, vinegar, oil, minced ginger, chopped date, and red pepper flakes to a blender and blend until smooth. You can skip the blending if you feel like you did a good enough job mincing the ginger and date, but I found the blender to be necessary for a smooth sauce. Transfer the sauce to a sauce pan and bring to a simmer on medium-low heat. Whisk in the arrowroot starch + water mixture and allow the sauce to thicken. Season with additional salt and pepper if needed. After the sauce thicken, pour it over the chicken, add the cashews, and bring everything to a simmer on medium low heat for an additional 2-3 minutes. Serve over a bed of rice or cauliflower rice and enjoy. Leave me a comment letting me know what you think and feel free to leave a rating down below! This post contains affiliate links. I only post links for products I personally use and believe in. If you make a purchase on Amazon after clicking one of my links, I receive a small commission. Don’t worry-the price you pay is not affected. Thank you! This looks delish! I believe Cornstartch is NOT Whole30 compliant, so for those of you who are doing it, careful. Thanks Isa! You’re totally right! I just list it as an option for people who don’t have access to tapioca/arrowroot & aren’t as concerned about it being whole30. My teenage daughter helped me make this and said upon tasting it, “this tastes like a real Chinese dish!” we were all blown away by the deliciousness. We also threw in some broccoli. And I am glad you added the step about arrowroot/water. I printed this week’s ago so I didn’t take that step (against my better judgment bc I know better, and regretted it.) Everything else is on point. I love all the ginger. Hi Eliza! So glad you both liked it! YUM! This was so good! Thank you for sharing this. It’s unlike any Whole30 recipe I’ve made for sure, and tastes totally legit. The only thing I need to change next time is stir the arrowroot powder in gradually – for me it became clumps that wouldn’t dissolve. But I really didn’t mind. The flavors were amazing! Thanks Cassandra! Good point about the arrowroot – I’ve added a little tweak to the recipe to make sure other people don’t have issues with that as well. Thanks so much for coming back to let me know what you thought! 2 complaints when making this the other night. I used coconut oil to fry the chicken and it made it all clump together and become very chewy. Also, the coconut aminos made it so salty I was unable to eat it. My partner ate it but said it was very salty. Hi Michael! Sorry to hear you guys didn’t enjoy it! I’m not really sure why the coconut oil would cause every thing to clump together – that’s not typically something that happens when using coconut oil this way. As for the coconut aminos I’m wondering what kind of brand you might have used. Do you know if the coconut aminos had any added salt to it? Usually with coconut aminos people find that they need to add more salt to it to get the same umami flavour as with soy sauce. For example: one teaspoon coconut aminos contains 113mg of sodium as opposed to one teaspoon of regular soy sauce containing 306mg. The tapioca can get gluey if it gets too wet ir not hot enough fast enough. Could that have been the issue? Looking forward to trying this…..have you used tamari instead of coconut aminos? I don’t like coconut aminos…..
Tamari works perfectly! I’d just recommend not adding any salt until the very end – tamari is a lot more salty than coconut aminos so you might not need quite as much in the end. Hope you like it! My husband and I made this tonight. We followed the recipe including adding the red pepper flakes. It was delicious, and I will include it in my monthly meal rotation. 🙂 Thank you!!! That’s awesome! Very happy to hear you guys enjoyed it – thanks for coming back to let me know how it went! Made this tonight. Did a few things differently and added zucchini, but wanted you to know, my whole family loved it!! Even the picky toddler! Will definitely be adding this to our rotation. Thanks for the recipe! I don’t know if it’s posted on here and I just didn’t see it but I wanted to share! While peanuts are low FODMAP they are not allowed in a Paleo or Whole 30 diet as they are legumes. I just didn’t know if you might want to specify that next to them for anyone new to those ways of eating! Can’t wait to make this tonight! Thanks Moriah! You’re right! I should make that more clear! I figured a lot of people who were trying this were more interested in it being low FODMAP than paleo but I’ll make sure to include that so that people can make more informed decisions. I also used chicken thighs instead, and didn’t have any arrowroot flour so didn’t thicken the sauce and it actually turned out perfect and soaked into the cauliflower rice beautifully. Also added red capsicum and brocollini! Will definitely make again, probably didn’t need the 1/2tsp salt, little bit salty! Made this recipe with arrowroot powder instead of the tapioca starch (because thats what I had in the cabinet!) and added a bunch more veggies (broccoli, green beans, carrots) and it was wonderful! Loved the sauce, just enough sweetness to it, and the chicken came out wonderful! Happy NewYear! I’m starting my first Whole30 tomorrow and I can’t wait to try this recipe during the program! Question: Is absolutely necessary to use tapioca flour to coat the chicken or can I use the arrowroot flour that I already have on hand? I see you recommend using the arrowroot flour as a thickener, but I want to use it to bread the chicken so I won’t have buy yet another very specific ingredient like tapioca flour. Thanks! Arrowroot should be fine – I don’t usually use that specifically to batter things, but I don’t see it being an issue. Good luck on your whole 30! This was a delicious dinner. I am on whole 30 currently. I used chicken thighs instead of breasts added a lot of flavor. And didn’t coat the chicken in the arrowroot flower at all, just sprinkled with salt and pepper. All was delicious. Thank you!! I made this tonight and my family loved it. My husband could not stop talking about it. His only complaint was that there was not enough for thirds. Thanks for a great recipe! As far as complaints go I’m pretty happy with that one 🙂 So glad you guys enjoyed it! I made this tonight for my family (doing a whole family Whole30) and it was delicious! It was a great hit! I paired it with frozen veggie stir fry and it was so tasty. Thanks for the recipe! 1) mine turned out too saucy…any suggestions? 2) also what is the “oil for frying” used for? Is it used for the chicken after its coated? Hi Sandra! Thanks for pointing out the oil part to me – I’ll rewrite that to make it more clear. You’re right! It’s for frying the chicken after it’s coated. As for the sauce I would suggest just adding less of it to the chicken. Sometimes when I make things that I think might be too over powering with the sauce I serve the sauce on the side so that everyone can pour over the amount that they like. Or if it’s already too late and the sauce is added I’ll add rice or something to soak up some of the extras. Hope that helps! I made this tonight and my husband and I both were overwhelmed with the ginger in the sauce…I used 1.5 tablespoons…is there something I could add next time so it’s not so gingery or should I just add less ginger? Sorry to hear the ginger was too much for you both! We are a family of ginger lovers so we can go a little crazy with it sometimes. Next time start with 1/2 tablespoon of ginger when makingand see how you like it. You can always taste it as you go and add more later if you think it needs it. Hope that helps! It does! I will try this again, thank you! This is delicious! It tasted like we had Chinese take out for dinner. I did add asparagus and Zuchinni for more veggies. 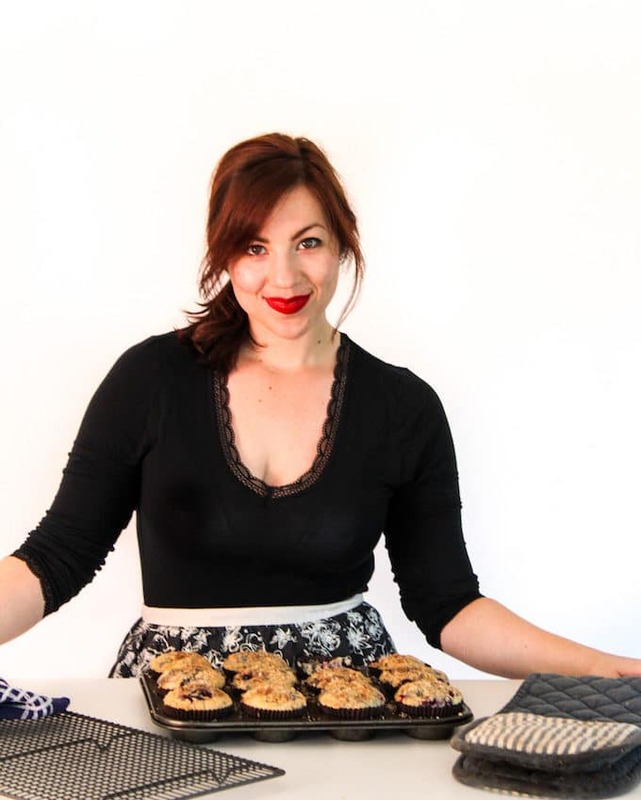 I love all your recipes and am new to the low FODMAP diet. I thought I read cashews are high FODMAP though? I will definitely make this either way though, it looks too good to pass up! You’re right! I think I must have gotten cashews mixed up with other types of nuts and thought they were alright in moderation- I’ll make a note at the top of the post for other people to read. That being said, I’m actually in the process of amending a few of my other recipe categories. Since we first started the low FODMAP diet there were a few food items that the jury was still out on (like coconut flour) that are now considered to be medium-high FODMAP. I’m in the process of going back and making sure things are labeled correctly now, so if you see anything else that’s wrong let me know and I can sort it out. My husband and I are currently doing the Whole30 and decided to try something other than meat and veggies. This recipe was amazing! I followed it as directed, except added more bell peppers. Next time I may try additional veggies (maybe a frozen stir-fry veggie pack to save time) and even water chestnuts. We made cauliflower rice in addition. This recipe is full of flavor and easy to make! I”m excited to make this recipe! I’m doing my first Whole30 so I’m constantly trying to find recipes I love that are “paleo-fied.” Just a quick question…why the date? I’m not a huge fan of them and I’m trying to figure out if I even need it or if I can substitute something else. Congrats on doing a Whole30! The reason for the date is to add a bit of sweetness to the dish. Since honey/maple/other types of sugars aren’t technically allowed I like to use dates sparingly instead. I’m not really sure about substitutions for the dates in this particular recipe. I’ve seen Nom Nom Paleo use apple juice as a sweetener so you could try that, but I don’t know how much that changes the flavor. Hope that helps! Oh that makes me so happy to hear! Thanks, Hannah! Thanks, Kaila! I was a bit hesitant to try out coconut aminos at first, but once I tried it I was sold. I find that it’s not quite as salty tasting as regular soy sauce, but it’s a great substitute all in all. Have a great weekend! Thank you so much, Allie! That makes me so happy to hear 🙂 Hope you and your family like it like we do! I’m earmarking this recipe for later, looks wonderful and would love to it give this a try. 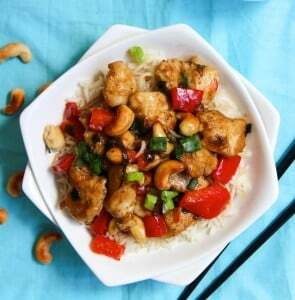 I hope you like it as much as I do – I looove cashew chicken!